The statue is a replica of a photograph taken of a sailor grabbing and kissing a woman in Times Square on V-J Day on Aug. 14, 1945.
Corrections & clarifications: This story has been corrected to say the Sarasota statue is based on a photograph by Victor Jorgensen. STUART, Fla. – The "kissing sailor" statue in Sarasota, a replica of a Times Square photograph taken after the end of World War II, was spray painted with #MeToo, just after the man in the photo died, according to police. The Sarasota Police Department tweeted Tuesday morning that police were dispatched to the statue around 12:53 a.m. for a report of a person vandalizing the "Unconditional Surrender" statue. When officers arrived, they saw the words "#MeToo" painted on the woman's leg left. Police believe the incident happened Monday, but there are no surveillance cameras in the area and no witnesses, authorities say. Damage is estimated at more than $1,000, police say. The graffiti had been removed by mid-morning Tuesday, with the city tweeting new photos of the statue. The statue, which sculptor Seaward Johnson based on a photograph by Victor Jorgensen called "Kissing the War Goodbye," portrays a sailor grabbing and kissing a stranger — a female dental student in a white dress — on V-J Day in New York City's Times Square on Aug. 14, 1945, to celebrate the U.S. victory over Japan in World War II. The sailor mistakenly thought the woman was a nurse in the war because of her uniform. 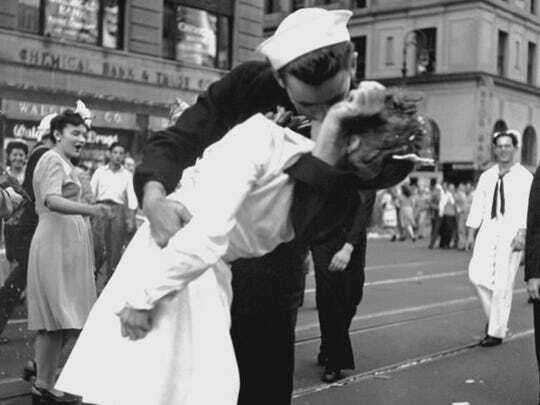 A more famous photo of the kiss was taken from a different angle by Alfred Eisenstaedt. On Sunday, the man in the photograph, George Mendonsa, died at 95 after a seizure and fall in his assisted living facility. In recent years, some have been critical of the photo after the woman in it, Greta Zimmer Friedman, said it wasn’t her choice to be kissed. "The guy just came over and kissed or grabbed," she told the Veterans History Project with the Library of Congress in 2005. "It was just somebody really celebrating. But it wasn’t a romantic event." However, when Eisenstaedt snapped his picture, he did not document any information about the photo's subjects, and their identities were a mystery for years. In 1980, Life magazine, which first published the Eisenstaedt photo, contacted Friedman and she met with Eisenstaedt. She had previously reached out the magazine to notify the publication that it was her in the photo, but they told her it was someone else. Friedman died in 2016 at 92. Maureen Kenyon is TCPalm's trends reporter. Follow her on Twitter @_MaureenKenyon_.